Our cloud-based software is the brain of our solutions. WIB provides retailers with a proprietary management platform that enables them to remotely control and manage all aspects of our solutions. Some of these are temperature control, functioning of the handling system and stock management, sales flows, data analysis and consumer profiling, multimedia contents for the digital signage screens, marketing campaigns through various channels such as SMS, push notifications and e-mails and many more. 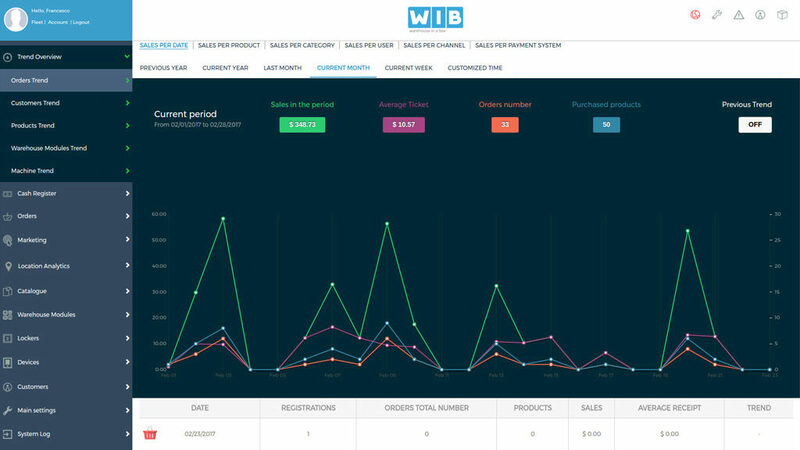 WIB Units can be managed individually or in groups. All data flows and implementations are in real time. Furthermore, WIB tailor design and produce both the mobile and desktop versions of our e-commerce platforms according to individual needs. Product updates, tips&tricks and more! Enquiries? We're just one mail away!